Last year I filed Form 15G by visiting bank physically. This year my friend shared with me that From15G can be filed online. So, this time I decided to submit form 15G online. However, I could not submit form 15G online. It was not due to system error or website problem. It was mainly due to my interest income has exceeded minimum tax exemption limit. I finally visited the bank and asked bank officer to accept my Form 15G. However, the bank has also refused to accept from 15G. 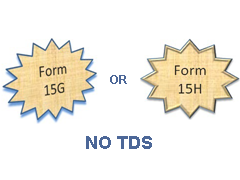 So, the question arises that under what condition we can file Form 15G or Form 15H to avoid TDS. Here is an elaborate guide about Form 15G and Form 15H and its benefit. Form 15G and Form 15H are used to save TDS on interest income. Suppose you have taken fixed deposit with a bank and interest income from this fixed deposit is exceeding Rs.10000 in a year. In such case, a bank is liable to deduct TDS. But if your total income is below taxable limit, you can submit Form 15G and Form 15H to the bank requesting them not to deduct TDS on your interest income. Form 15G and Form 15H are valid only for one financial year. So you need to submit these form every year based on your eligibility. It is advisable to submit this form at the beginning of every financial year in order to ensure bank does not deduct any TDS on your income. You should be an individual or HUF. You must be a resident of India and hold valid PAN. Your age should be less than 60 years. Tax calculated on your total income is NIL. Total interest income for the year should not exceed minimum tax exemption limit. You should be an individual. Your age should be more than or equal 60 years. How to submit Form 15G or Form 15H online? Some banks like SBI, HDFC and ICICI allow these forms to be submitted online through the bank’s website. In order to file Form 15G or Form 15H online on SBI website login using on SBI site using username and password. On left side tab, you will find Form 15G/15H enquiry and Generate 15G/H link. Click on generate 15G/H link and enter branch code. Click on button get branch name. Once branch name is displayed click on Submit button. The system will display Form 15G. Fill up the form and click on submit button to complete the process. Once a form is submitted online you need to take print out and submit three physical copy after authorization to the bank. Although it is clear that Form 15G and Form 15H is used for saving tax on interest income, there are some common misconception about these forms. Myth – Anyone who wishes to save tax can file Form 15G and Form 15H. Reality – Only person with income below taxable limit and Nil Tax liability can file from 15G and form 15H to avoid TDS. Myth – Once a form is submitted no need to declare the income in ITR. Reality – You need to clear the income from interest in ITR although form 15G or 15H is filed. Myth – Submission of this form once is sufficient. Reality – This form needs to be submitted to a bank every financial year. Hope your doubts about Form 15G and Form 15H are clarified. If you have any further question feel free to post it in the comment section. « How to use BHIM Aadhaar Pay app? I am a super citizen (above 80yrs.) My income is much below Rs.5lakhs. I should submit which Form No. 15 G or 15H to avoid deduction at source. You need to fill up Form 15H to avoid tax deduction at source. My taxable income for FY 2017-2018 is 294000 after investment of 150000. My calculated tax is nil as my net taxable income below 350000. Can I submit form 15? If your total interest income for the year is not exceeding minimum tax exemption limit you can submit form 15. My income from interest will be 274000, will invest 40000 in Elss . Hw to file 15G as bank refuse to do so as income cross 2.50 L.. Thank in advance. As interest income is above taxable limit you can not file form 15G/H.